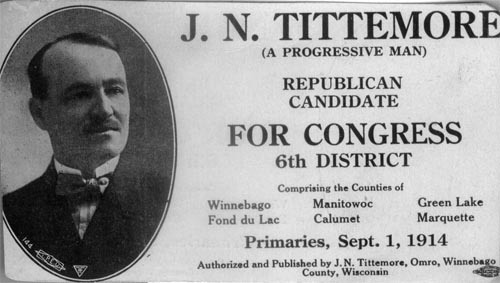 J. N. Tittemore (A Progressive Man), Republican Candidate for Congress, 6th District, Comprising the Counties of Winnebago, Manitowoc, Green Lake, Fond du Lac, Calumet, Marquette. Primaries, Sept. 1, 1914. Authorized and Published by J. N. Tittemore, Omro, Winnebago County, Wisconsin. Are you looking for TITTEMORE ancestors? If so, we suggest posting a query to our Community Message Board to get assistance from other researchers.